← Kyūyō, Appendix Vol. IV, No. 158: In 1851 a new vaccination method was established and used by all people. Kyūyō, Appendix Vol. IV, No. 160: When an epidemic spread out in 1852, all Japanese officials who stayed in this country [Ryūkyū] issued rice and money to provide for the poor homes of all villages. In addition, a medical assistant gave treatment everywhere. In this year , at the time when an epidemic spread out out, the former kanshukan Shimazu Noboru issued around 450 liter (2 koku and 5 to) of husked rice to be provided to the poor homes in Naha. Nomoto Ichirō, Hori Yozaemon, and Ijūin Jizaemon issued 2250 kanmon of copper coins to be provided to the poor homes in Izumisaku village. The product investigator Imai Tōsuke issued 5170 kanmon of copper coins to be provided to the poor homes in the four villages of Naha [i.e. Nishi, Higashi, Wakasa and Izumizaki]. And the medical assistant Yumae Ryūtō made rounds and visited the patients and their families and gave many treatments, and he also provided medicine to the poor homes. Notes: The title of this little piece unequivocally talks about all Japanese officials who stayed in Ryūkyū at that time. This refers to the Satsuma Resident Commissioner (Zaiban Bugyō 在番奉行) and his personnel stationed in Naha. According to the above description, Shimazu Noboru 島津登 served as the Satsuma Resident Commissioner stationed in Naha at that time – or, since it says “the former kanshukan,” he had remained on Okinawa after he already finished his tour. In any case, shortly after this he served Satsuma daimyō Shimazu Nariakira 島津斉彬 (1809–1858) as “Official for Building Ryūkyū-style Gunboats” (Ryūkyū Taihō-sen Zōsen-kakari 琉球大砲船造船掛). In this duty he participated in the completion of the “Ryūkyū-style Gunboat” (Ryū Taihō-sen 琉大砲船). In order to suppress the naval power of the various feudal lords, in 1635 the Tokugawa shogunate enacted a ban on the construction of large-scale ocean-capable vessels of 90 tons or above (Ōbune Kenzō Kinshirei 大船建造禁止令). Later the ban was relaxed, but only for merchant ships. Ryūkyū had been a port of call for Western ships since the early 19th century and in increasing frequency towards the 1850s. European, US American and Russian ships also appeared at the Japanese coast. Even at that time the shogunate did not allow the feudal lords the construction of large military ships and Western-style ships. After his appointment as the feudal lord of Satsuma in 1851, Shimazu Nariakira (1809–1858) adopted the policy of “Enrich the state, strengthen the military” (Fukoku kyōhei 富国強兵). Together with Tokugawa Nariaki (1800–1860), the feudal lord of the Mito domain, he stood out among the numerous advocates of large ships during the closing days of the Tokugawa shogunate. Furthermore, he was also backed by the abundant financial resources that have been accumulated during the Tenpō Reforms (1842–45). On 1852-12-27, under the pretense of defending the Ryukyu Kingdom, which was under Satsuma’s patronage at the time, he submitted to the shogunate his desire to build a “Ryūkyū-style Gunboat” (Ryū Taihō-sen), which was granted on 1853-04-29. Construction work commenced at the Sakurajima Seto shipyard on 1853-05-29. In between these two dates, the US East India Fleet under command of Matthew Perry arrived on Okinawa, staying from May 17–26. Perry reached Edo on 8 July 1853. 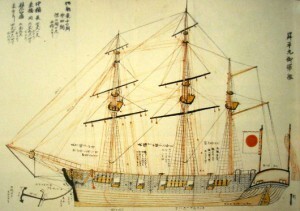 Shimazu Nariakira also presented the shōgunate government with the construction plan for 15 warships, which was also approved in the 12th month of 1853. In the 7th month of 1854 the construction of 44m long Daigen-maru 大元丸 and Shoten-maru 承天丸, as well as of 36,4 m long Hōzu-maru 鳳瑞丸 and Mannen-maru 万年丸 was begun. Meanwhile, the shogunate, led by Abe Masahiro 阿部正弘, ordered the construction of the warship Asahi-maru 旭日丸 (Rising Sun) in Mito province in August 1853. Abe also gave permission to the Uraga magistracy to construct the warship Hōō-maru 鳳凰丸 (Phoenix) in September 1853. Finally, on 15 September 1853 the earlier-mentioned law banning the construction of large-scale vessels was repealed. “Ryūkyū-style Gunboat” (Ryū Taihō-sen 琉大砲船), AKA Shōhei-maru 昇平丸. Source: Wikipedia. The “Ryūkyū-style Gunboat” (Ryū Taihō-sen) was built by the Satsuma Domain between 1853 to 1854 at the Sakurashima Setomura shipyard in what is now Kagoshima Prefecture. It was a Western-style warship with three-masts, an (estimated) displacement of 370 tons, an overall length of 31.0m, an overall width of 7.3m, and was equipped with 10 cannons. It was completed 1854-12-12, nineteen months after works had begun. It was the first Western-style warship begun to be built in Japan, and the second one completed, following only Hōō-maru, which was commissioned 1854-05-10. Well, the idea of the “Ryūkyū-style Gunboat” (Ryū Taihō-sen) was that of a junk tailored as a Western-style warship. On 1855-01-26 it was renamed to Shōhei-maru 昇平丸. On 1855-01-26 it cruised to Edo and was presented to the shogunate government on 1855-08-13. Afterwards it was placed at Shinagawa and primarily used as a training ship, such as for students of the Nagasaki Naval Training Center. Following the Meiji Restoration (1869) it got placed under jurisdiction of the Meiji administrative unit for Hokkaido and used as a troop transport ship. In 1870-03 it encountered a storm off the coast of Matsumae, and in high waves stranded and shiprecked at the coast of Kaminokuni Kinoko village in Hokkaidō. In the 7th month of this year 1851, four Japanese officials stationed here in Ryūkyū who had taken them into custody left their office and returned them to their own home country of Japan. These four Japanese officials who took them into custody and questioned them were most probably none other than Shimazu Noboru 島津登, Nomoto Ichirō 野元一郎, Hori Yozaemon 堀与左衛門, and Ijūin Jizaemon 伊集院次左衛門. That is, the officials mentioned in the Kyūyō article in the beginning of this post. This is confirmed by the “Records of Investigations of the Resident Guard on Ryūkyū” (琉球使番取調記録), in which Hori Yozaemon and Nomoto Ichirō report about “hearsay about a foreign country inquired from persons washed ashore.” This quote refers to nothing else but the interrogation of Nakahama Manjirō and his friends. Adachi Hiroyuki: Kindai no Zōsen Akebono (Dawn of Modern Shipbuilding – Shōhei-maru, Asahi-maru, Hōō-maru) [安達裕之: 近代造船の曙 –昇平丸 ・旭日丸 ・鳳凰丸]. In: TECHNO MARINE No. 864, Japanese Society of Naval Architects and Ocean Engineers. 2001, pp. 35–42. Nakahama Hiroshi: Nakahama Manjirō – “Amerika” o hajimete tsutaeta Nihonjin. Fuzanbō Intānashonaru, Tōkyō 2005. 中濱博: 中浜万次郎: 「アメリカ」を初めて伝えた日本人. 冨山房インタ-ナショナル 2005. This entry was posted in Kyūyō and tagged Asahi-maru, Hōō-maru, Ryūkyū-style Gunboat, Shimazu Nariakira, Shōhei-maru, 大船建造禁止令, 島津斉彬, 旭日丸, 昇平丸, 琉大砲船, 鳳凰丸. Bookmark the permalink.